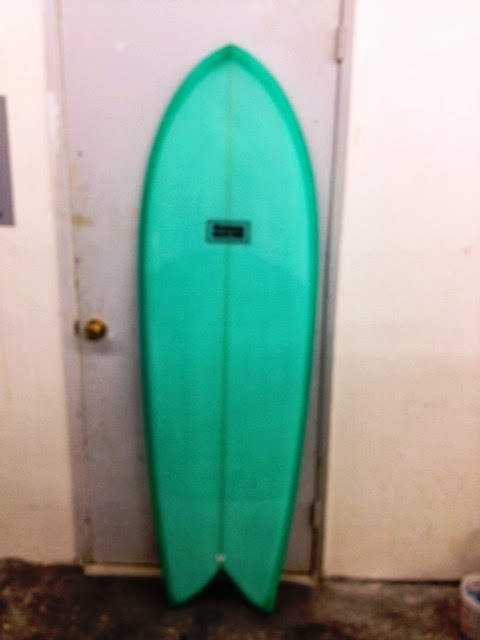 Here’s the new custom 5-10 fish kneeboard I built for local kneeboarder Sam. If the outline looks “classic”, well…that’s because it has an impressive pedigree. 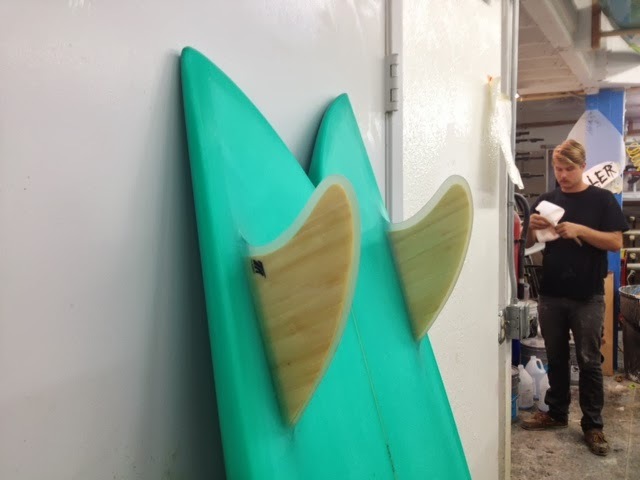 Sam had a 5-8 fish kneeboard that was built for him several years ago by hull maestro, Greg Liddle. 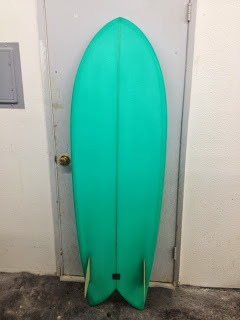 That board was a copy of a Steve Lis fish kneeboard. Sam brought the 5-8 fish to me, and asked for a similar shape, but longer and thicker. Measurements were taken, templates drawn and fin placement scrutinized. Sam chose the Hobie Fish template from my friends at True Ames Fins. The glass-on fins are asymetrically foiled and were set with just a slight toe-in, adding a little modern touch to this otherwise traditional shape. But the fun part of this build was Sam’s direct participation. He was there when I took the rocker measurements, and helped me template the original board. Once I had the blank, Sam watched the whole 4 hr shaping process, and gave me input on what he liked and what he wanted changed, as in “hey Sam, feel these rails and tell me if you want a little more taken off”. Shaping a custom surfboard should be a collaboration between shaper and surfer, and I encourage all my customers to participate in the process.